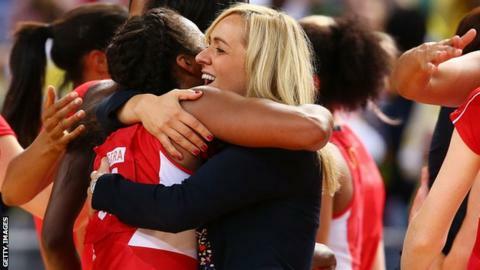 Tracey Neville believes she is the right person to coach England on a permanent basis after leading them to a bronze medal at the Netball World Cup. Anna Mayes was dismissed as head coach in March and Neville, 38, was brought in from domestic Superleague side Manchester Thunder to coach the national team in Sydney. "I've had great support throughout this campaign," she told BBC Sport. "I feel like I have the knowledge to take this country forward." She added: "Going forward, whether it's with me or with another coach, I'll be 100% behind these girls." Neville was appointed after England's disappointing fourth-place finish at the Commonwealth Games in 2014. Under her leadership the Roses won six of their eight games at the World Cup, and claimed bronze after beating 66-44 Jamaica on Sunday. She had to deal with the sudden death of her father, Neville Neville, at the start of the tournament but opted to stay in Sydney to see out the competition. England netball chief executive Joanne Adams told the BBC there is "no doubt" in her mind that Neville is right for the job, but they will let her take a break before making a decision on her future. "I came into this job late, off the back of a Manchester Thunder season, so I feel like I've been on a rollercoaster," added Neville, who is the sister of former Manchester United footballers Gary and Phil Neville. "It's now time to go away to go away and accept what has happened. "The public support I've had and my family have had has been unreal. I just wish he was here to share this moment with me."